Locktime Field in a transaction used for post-dating. Locktime sets the eariest time a transaction can be mined in to a block. It's the last field in a piece of transaction data. You can use locktime to make sure that a transaction is locked until a specific block height, or a point in time. < 500000000 Unlocked at block height. If you do not want your transaction to be locked until a specific block or time, set the locktime field to 0x00000000 (or anything below the current block height or unix time). Nodes validate every transaction (and block) they receive. So if they receive a transaction (or a block containing a transaction) with a locktime in the future, they will reject it. 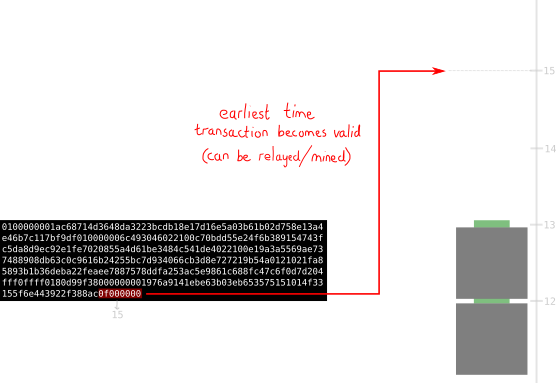 Most transactions do not make use of locktime, so their locktime is set to 0x00000000. In order for the locktime to be effective, you need to set one of the sequence values (for one of the inputs in the transaction data) to anything below the defaut maximum (0xffffffff). Unix Time is the number of seconds since 1st January 1970. It's going to take 9,502 years before we hit block 500,000,000. The current unix time is 1,555,949,491 (also known as 22 April 2019, 17:11:31), which is already above 500,000,000.